Creeping Oregon Grape Holly is an excellent, durable, semi-evergreen low maintenance shrub for massed plantings or borders. The new leaves emerge in spring with a bronze-red color, turning to glossy, deep green. The leaves turn purple-red for the winter. 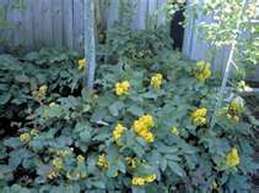 It has fragrant yellow blossoms in spring followed by clusters of edible blue-black berries later in the summer. Holly likes to be planted in full sun or partial sun.